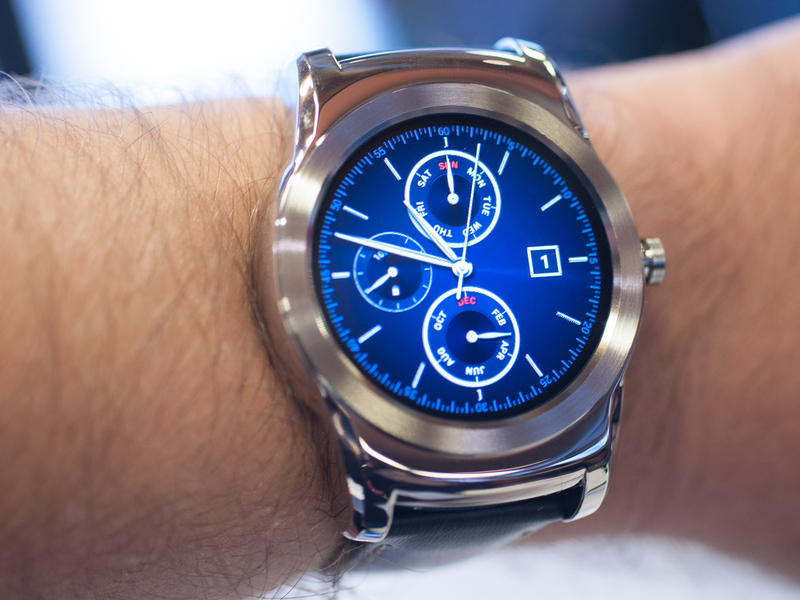 In a relatively short amount of time, LG has rapidly developed its smartwatch portfolio. Starting with the original square reference device for Android Wear, the G Watch, and evolving later last year into a more traditional watch design with the G Watch R. Now, still less than a year on from its first smartwatch, LG brings us what's arguably the best-looking Android Wear smartwatch yet, the LG Watch Urbane. Broadly based upon the design of the G Watch R, the Urbane steps things up a notch with a polished metal chassis reminiscent of a traditional high-quality analog wearable — a step in the direction of jewelry, as opposed to technology. But that's not the end of the story — the LG Watch Urbane comes in two flavors. In addition to the standard Android Wear version, LG has developed an LTE-capable version based upon its own "LG Wearable Platform" software, which is based upon webOS. It's the first smartwatch with 4G connectivity, looking a lot like the LG/Audi prototype smartwatch teased at CES. We've had the chance to preview both versions of the Watch Urbane ahead of Mobile World Congress. Read on for our first impressions! Picking up the LG Watch Urbane for the first time, what's striking is how much it ages the still relatively new G Watch R. The Urbane still looks more like a smartwatch than a piece of expensive jewellery, but it's much classier proposition than LG's first circular wearable. The painted metal frame of old has been replaced with a polished exterior in gold and silver color options. The unsightly etched numbers around the bezel are gone, as LG cuts down on unnecessary cruft. It's also noticeably less bulky than the G Watch R in all directions, and the lack of extraneous space around the display just makes it feel like a more elegant timepiece. And speaking of that display, it's the same fantastic P-OLED display we've been using on the G Watch R for the past few months — easily visible even in bright sunlight, with vivid colors to boot. There's no Moto 360-style ambient light sensor, however, so you'll need to set your brightness level manually. While the LG Watch Urbane lacks the weightiness you'd expect from a high-quality wristwatch, it does, like all good smartwatches, do a decent job of imitating the look of such a device, and there's no denying the progress LG's made in this area in a relatively short space of time. Even the rear of the phone, housing the biometric sensors and charging pins, has been classed up with a more reflective texture. And the stitched leather strap is much softer than earlier efforts, though we'd argue still not quite as nice as the Horween leather of the Moto 360, or the calfskin of the ZenWatch. As before, though, you'll be able to swap out your straps if you so desire. So what hasn't changed? Well, the device still runs Android Wear 5.0.2, which functions much the same as we've seen on other circular watches, despite the addition of a handful of gold and silver watch faces to match the Urbane's new aesthetic. And the internals are basically unchanged — it's rocking the same combination of Snapdragon 400, 512MB of RAM and 410mAh battery seen in the G Watch R. Given the similarities in specs, we'd expect the Urbane to line up with its predecessor in terms of battery life too — specifically, easily lasting a full day, perhaps even a second with lighter use. The LG Watch Urbane sees LG launching a new brand for its premium smartwatch line. This is supposed to look like a sophisticated watch, and for the most part it is. (That said, smartwatches seldom look as good in person as they do in press renders, and the Urbane is no exception.) What it is, though, is a welcome improvement upon what was already a pretty solid Android Wear smartwatch, and a product that leaves us eager to see where LG's adventure in wearables leads them next. The name of LG's second new smartwatch, the LG Watch Urbane LTE, might suggest that it's the same watch with an extra helping of cellular radios, but that's not that case. It also looks quite a bit different, with a brushed sainless steel frame, and it's a pretty classy piece of technology, though in a different way to its Android Wear-powered cousin. But really that's where the similarities end — this is a new type of smartwatch from LG, a watch that can function as a standalone mobile device as well as pairing with an Android phone to show you notifications, calls and other stuff. It's also bigger, bulker and more powerful, with an all-new software experience that's all LG. There's no mistaking that the Urbane LTE chunkier watch than the regular Urbane, and that's because there's a lot more going on under the hood. As the name suggests, the Urbane LTE is the first smartwatch to come with 4G connectivity, and the internals have been beefed up a little as well. You now get a full gigabyte of RAM alongside that Snapdragon 400 processor, and the battery has been boosted to a 700mAh cell to accommodate the extra power requirements of LTE. Like the regular Urbane, the LTE version also uses LG's impressive Plastic OLED panel — a technology proven on devices like the original G Watch. And there's a similar biometric sensor rig around the back too for taking heart rate measurements in the built-in LG Health app. The weightier, heftier look and feel of the Urbane LTE is not unlike that of a sportswatch, with a rubber strap and metal clasp locking things securely in place. You also get three buttons instead of the single key we're used to on Android Wear, and that's because this is the first watch to run LG's new wearable platform, which is based on webOS. You won't find any references to webOS in the software, but behind the scenes it's running the same core software as LG's smart TVs. For all the software differences — and there are a bunch, because this is a whole new wearable OS — there are some similarities with what we've used on the G Watch R and other devices, including familiar watch faces and swiping gestures in places. Nevertheless, it's clear this is LG's watch from the ground up, offering a much more expansive feature set than is available on Android Wear. Like Samsung's Tizen watches, you can make calls and send text messages and emails directly on the Urbane LTE, and of course the cellular connection means you can use it without a phone — though it'll also pair with Android phones through an app LG will release onto Google Play in order to fulfil the same "second screen" functionality as an Android Wear watch. That said, LG's Wearable Platform is primarily about running applications on the watch itself, instead of the phone-led approach of Android Wear. That's clear once you dive into the apps menu, which presents you with a scrolling wheel of icons to choose from. There's something about rotating your finger on a circular display to scroll through this menu that just feels more natural than the card and list-based views we've seen on other watches. There's also a new physical button system to get to grips with, with three keys located on the right edge. The bottom button cycles through recent apps, while the top one gives you a settings wheel to control features like Bluetooth, Wifi and screen brightness. And there's NFC built in too, which allows the watch to authenticate wireless payments, though LG's not going into much detail on this feature at present. So that's the LG Watch Urbane LTE. It's a very different kind of smartwatch, blending the standalone approach of Samsung's Gear line with a classier metal chassis more reminiscent of a traditional timepiece. There are still big question marks over availability and pricing for the device; nevertheless, this is an intriguing piece of mobile tech, and we're looking forward to spending more time with it. What do you think of LG's new wearables? Share your thoughts down in the comments! !